Menta is a French startup, founded in 2007, that provides embedded FPGA IP for SoCs, ASICs and ASSPs. The company exhibited last week at the Design Automation Conference in Austin and will exhibit next week at the TSMC Technology Workshop in Herzliya. I spoke by phone with Menta’s biz development guru Yoan Dupret about the announcement, in the week prior to DAC, and asked if eFPGA IP is difficult to manufacture within a chip. Quoting from the Menta press release during our conversation, “Embedding an FPGA fabric as an IP core in an SoC allows semiconductor designers to update the silicon at will, post production, thereby eliminating the cost and time associated with re-spinning silicon,” I asked Dupret why all logic on an SoC should not be executed using eFPGA technology. Dupret referenced his presentation: “There are five different problems, as you can see on Slide 3, which our eFPGA solves. One is that the specifications are not well-defined when a design project starts. “Second is that several customers and/or markets require multiple variants of an ASIC. Third, the same ASIC needs to evolve over time in a specific portion of the logic – inkjet printer cartridge chips, as an example. In other words, in the costly world of semiconductors, it continues to be a balancing act between meeting product requirements and providing post-production flexibility because those requirements changed even as the product came off the line. Menta’s eFPGA IP is providing an antidote for the anguish that’s associated with those types of engineering change orders. The origin of the company’s name is, apparently, an interesting story in itself. Laurent Rougé, Menta founder, was a Franck Herbert Dune fan when he was a teenager. When creating Menta, he was reminded of a specific type of humanoid in the books – the Mentat – who are very clever and mimic the abilities of computers. As Menta was created, long after Laurent read Dune for the last time, the ending ‘t’ of Mentat slipped away and Mentat became Menta. June 6, 2016 – Menta announced deliver of the industry’s highest performing embedded programmable logic IP for SoCs. 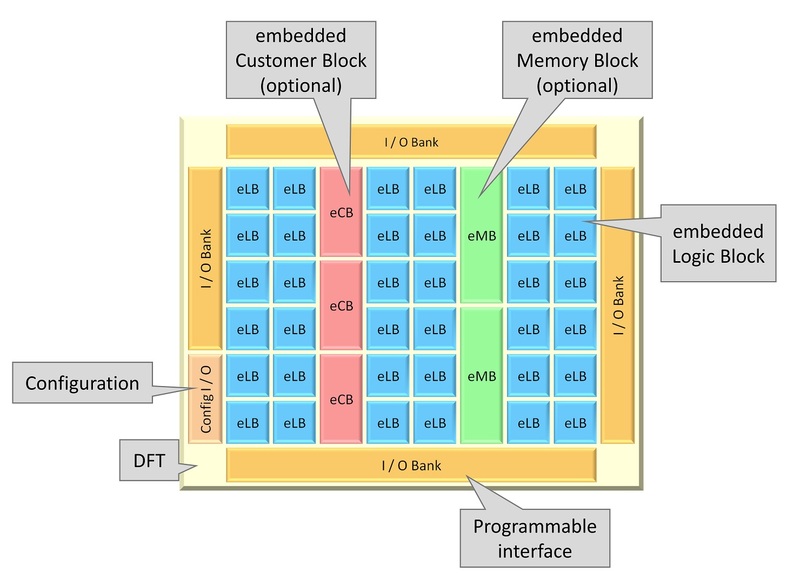 The programmable logic, available as both custom and pre-defined IP cores, is based on Menta’s proven eFPGA fabric, optimized to deliver the industry’s best combination of performance, reduced sized, and low power consumption. Version 4 of Menta’s custom and pre-defined eFPGA IP cores will benefit from a boost in performance, area usage, and lower power consumption. The company is also announcing expanded support for additional technology nodes: In addition to TSMC’s 28-nanometer HPM and STMicro’s 28-nanometer FDSOI, Menta’s IP is now optimized for GlobalFoundries 14-nanometer LPP process. Menta pre-defined eFPGAs have 7k-to-60k equivalent ASIC gates, plus DSP blocks. In addition, Menta can deliver custom IP cores with embedded logic blocks, embedded custom blocks, and embedded memory blocks – each of which are customizable in type, number and size to address various markets and applications. Menta provides both Origami Designer to define custom IP-based on the designer’s RTL, and Origami Programmer, an EDA tool that supports design from HDL design to bitstream, with synthesis, mapping, and place-and-route. This entry was posted on Thursday, June 16th, 2016 at 9:34 pm. You can follow any responses to this entry through the RSS 2.0 feed. You can leave a response, or trackback from your own site.